May 6, 2014 the Fashion stuff., the Hair stuff., the Makeup stuff. How I want you to look, and what I’d wear to the Met Ball. So, wow. It’s been a while. And believe me- it’s not that there hasn’t been enough to discuss about beauty, but rather I’m finding that there’s just too much. This past month I’ve tried new products (hello, Aveda Dry Remedy! ), gotten blow-outs at a couple different salons (which always makes for an interesting experience), gone crazy over various celebrity things having to do with hair and makeup, and have started marching toward bridal makeup season. Oh, and my nine-to-five is kuh-RAAAAAzy busy right now. And I’ve been reading like a maniac. I don’t know what’s come over me (oh wait … I do … it’s this), but lately I’ve been consuming books like a rabid animal consumes an unsuspecting person’s ankle. There’s just no stopping it. And that’s okay. But does anyone have any book recommendations? I tend to prefer narratives with psychosis, obsession, and personality disorders. Got it? Good. What’s kind of sad is that this coming month is going to be even more ridiculous. And the next. But what’s been fun is that in all the chaos, I’ve managed to do some fun introspection (those two are typically mutually exclusive) on my style. And for this post, it goes a bit beyond just hair and makeup but into the wardrobe as well. I sorted out my closet the other day and I noticed that it was sort of a mish-mash of … good stuff, I suppose. I love everything in my closet, but some of it just doesn’t get, well, worn. Over the years I’ve had a tendency to purchase things that aren’t necessarily akin to my own, true aesthetic. Well, I’ve been trying to sort that out lately. I’ve tried to take an inventory on what pieces show up most in my closet (black, denim, leather, t-shirts), and where I could perhaps use a pop of color (because it turns out I’m not nearly as daring as I’d thought when it comes to things like yellow). 1. I want you to look natural. Mostly. This tendency of mine has just evolved out of doing lots of bridal makeup, but I’ve always had a dislike for makeup that looks makeup-y. You know that look when the eyeshadow, the lipstick, the foundation, just seems to have a thick, done-up consistency to it? I hate that. Or when one wears the super glossy, hot pink lipstick for the lipstick, and not for how it looks on them? Not about that either. I want the makeup that I put on you to sort of look like it’s not even something that you really put on, like it could’ve come forth from your own pores. The eyeshadow might be gunmetal grey, but I want the feel of it to seem like in another dimension, you might have been born with that eyeshadow on. A lot of this also comes from studying celebrity makeup. The blending, the precision, the products, the meticulous selection process of which shades- a lot of times, celebrity red carpet makeup is simply a study in what works best and what will enhance. I tend to stick to a philosophy like that, one that sticks to what works best and what will enhance, as opposed to cover up. 2. I want your hair to look sort of messy and haphazard. I get that this is very much the trend of the times, but whenever I get hold of someone’s hair these days, they end up with messy, slightly gritty hair. And you also end up with me flipping you over and spraying Oribe’s Après Beach all over your head while shaking my hands through your mane. It’s a process I love. I’ve tended to be more within the Kate Moss camp when it’s come to hair as opposed to Kate Middleton’s. I like a bit of that day three look (notice I didn’t say day two), and I prefer a matte, almost shineless finish to a shimmering one. I’ll never forget reading an article in Elle magazine about this new product from Bumble&bumble called “Texture”, and how we finally had come up with a product that gave that rough, shineless finish that stylists would have to use five products to create on models’ hair for runway shows. That was in either January or February of 2011 … and I had the stuff used on my hair for my wedding day that following June. 3. I want you to glow. No, I did not say I want you to shimmer. I said I want you to glow. I have watched two makeup tutorial videos in my lifetime (yes, just two), one of which demonstrated how to cover up terrible, terrible acne, and the other which demonstrated how to emulate the carved-out cheekbones and plumped cheeks of the Renaissance era with just a bit of highlighting and contouring. 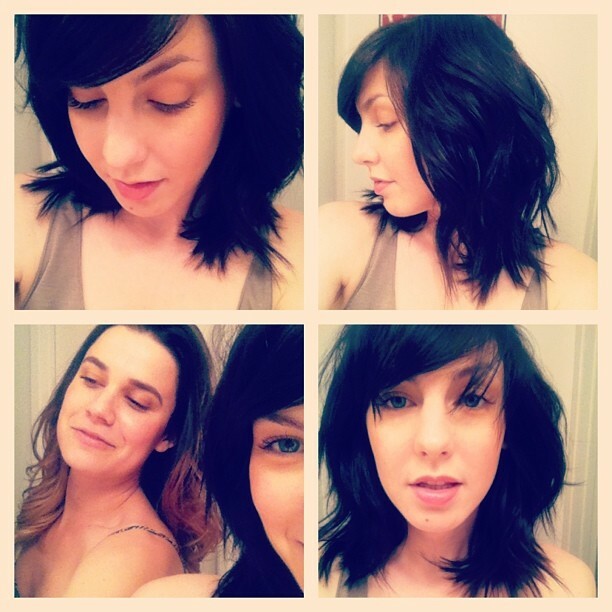 It was the easiest how-to ever (and everything is more exciting in a French accent). I’ve been using pearly cream shadow to dab on the weirdest spots of the face along with matte, pinkish-grey blush to add that extra half-inch that just makes your face glow. Again, I’m all about that “from within” thing; how your face looks after you’ve taken a post-workout shower. The best. But, it’s been difficult to translate all of this into how I feel about fashion. Big fashion. Like, Met Ball fashion. What kind of red carpet look speaks to me? Can I separate my affinity for a certain celebrity’s street style with their red carpet style? Because sometimes, a good choice for the pavement does not guarantee a good choice for the steps of the Metropolitan Museum of Art. For instance, I typically really like what Katie Holmes wears around town. However, her red carpet choices post-Tom have tended to be quite ho-hum (though her makeup/hair is always fantastic). On the flipside, Diane Kruger is usually the first person I look forward to seeing at events and premieres, but her street style is pretty meh. Surprise! But really. I love this dress. I love it. Is it lavender? Iridescent? Silver? Can’t really tell, but that’s what I love. It’s Hugo Boss, and it’s working (along with that mother of pearl box clutch … swoon). But you know what else is really working? That fan bun. I could barely find a shot of the back of it until I stumbled upon this, complete with a how-to! Score! 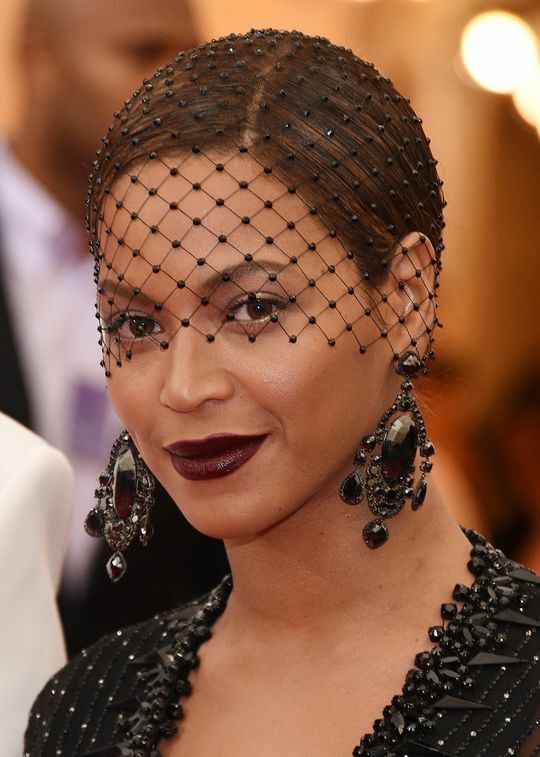 Her makeup, as always, is the greatest thing ever. EVER. Kristen Stewart, along with Keira Knightley, serves as a huge makeup inspiration of mine. She may have shown up to the Ball in what appeared to be a too-playful-and-not-serious-enough Chanel frock, but Kristen’s makeup was ON POINT. Kirsten Dunst in Rodarte. 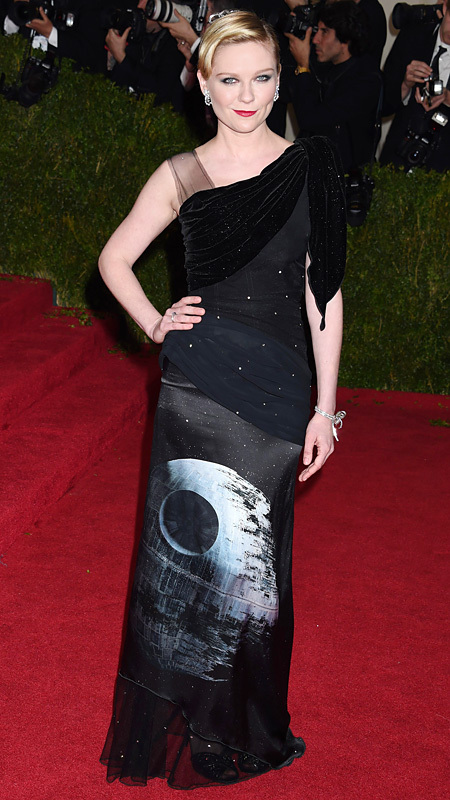 Or more specifically, Death Star Rodarte. Because if you could secretly get on with your bad nerd self without reservations, you would walk down the aisle in this. Don’t lie. Yeah, I guess she looks okay. Blake Lively in Gucci Premiere blah blah blah stunning blah blah blah perfection blah blah blah Green Lantern sucked. This, my friends, is what I would wear. This dress is the most “me”. It’s a little weird, and remember how in my Oscars post (I think) I said that I love gowns that are a little bit weird? Well this one’s got that. It looks like it’s got scales, it makes great use of sheer, and the color gradation is beautiful. And of course, it’s Givenchy … the same house responsible for Zoe Saldana’s purple confection from the 2010 Academy Awards that I won’t ever, ever get over. Bingo.